Good morning, dear friends! Today we are making a super easy, nutritious and healthy sweet treat which at the same time tastes heavenly! 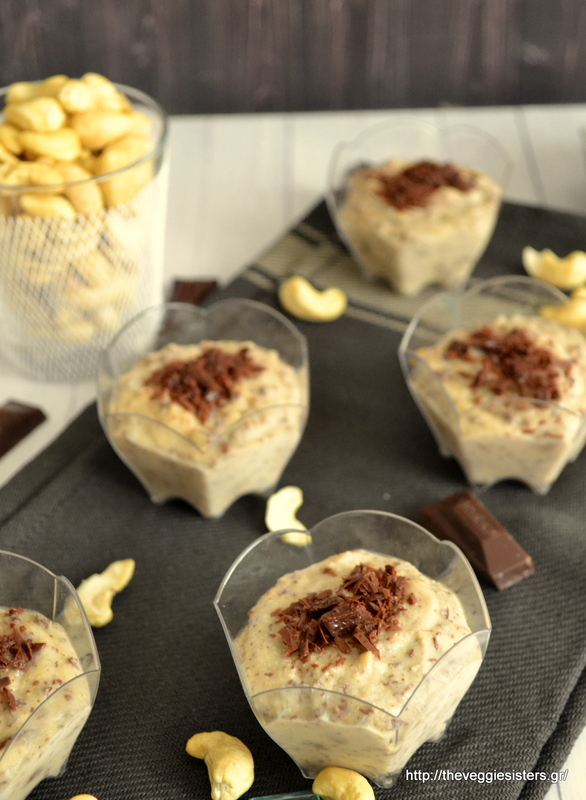 Raw stracciatella cream with just few ingredients served in mini cups! This is also a great dessert for a kid party! It is made with cashews (God, I love them! ), chocolate shavings and is scented with vanilla! It is absolutely quick and simple to make and I bet you will love it! The only bad thing is that you have to put it in the fridge overnight and allw to cool and set. So be patient! Happy weekend everyone! Kisses and hugs! Pulse cashews in a blender along with the water until creamy. Add almond cream, agave syrup, coconut oil and vanilla extract (one ingredient at a time) and pulse until well combined. Transfer the cream into a bowl and fold in chocolate shavings. Mix with a spatula. Empty cream into five mini cups, top with chocolate shavings and put in the fridge. Allow to cool overnight. Enjoy! Share the post "Stracciatella cream"